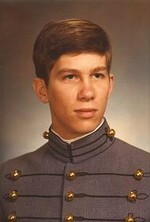 Graduated from Military Academy in 1983. Went to Korea where met my wife Sara. Returned to Ft Carson, CO (where we had our two daughters), then back to Korea for the last four years of my Army career. Left Army in 1993...moved to Washington DC suburbs. Worked as "beltway bandit" for six years before joining MITRE corporation where I've been ever since. I'm a principle engineer doing systems engineering work for the Army. Was in Pentagon on 9-11 but fortunately about 100 yds from impact area. Office damaged in the subsequent fire (or more appropriately, the water damage from the fire fighting), so never returned to that office and worked several years just outside the Pentagon. 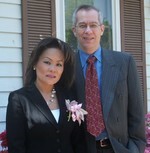 Now living in Vienna VA and working in McLean and Ft Belvoir. My wife and I are now empty nesters with one daughter in Manhattan; other is junior at James Madison Univ. Steve Klynsma has a birthday today. Me in front of my old house in Springfield VA.
God's blessed me with a very beautiful wife. Hard to believe, eh?